New College students are taking the independent-minded and counterculture nature of their curriculum and are quite literally, bringing it to the streets. At home in Sarasota and as far away as Ohio And Standing Rock, New College students are taking the independent-minded and counterculture nature of their curriculum and are quite literally, bringing it to the streets. While New College has always attracted a community of independent thinkers and socially conscious individuals, the recent establishment of campus groups like Students Targeting Oppressive Powers, Black Student Union and Latinx Club has given like-minded students the ability to organize and mobilize in the past year. Commitment to social causes has been in New College’s DNA since its inception. In 1970, faculty voted for campus moratoriums to allow students to join in national protests against the Vietnam War. They suspended classes to protest the Kent State shootings. Students also pitched in to teach in Sarasota “protest schools” to support the historically black area of Sarasota, known as Newtown, in that community’s boycott of the Sarasota school system. And in 1972, first-year student Nan Freeman was killed during protests supporting migrant workers in the sugar industry. That activism persists in the New College education and continues to motivate students. “Our curriculum definitely embodies a spirit of unpacking and deconstructing why social inequalities exist, and New College students embody that,” said thesis student Paul Loriston, former co-president of the NCSA. Loriston co-founded the Black Student Union last year and was one of the main organizers of the Black History Month Planning Committee for 2017. The theme centered around Black Action, and the ways in which students can get involved in their communities, from advocating for Newtown, to getting involved with Black Lives Matter chapters in the area by attending meetings or showing up to protests in the Manasota area. That is exactly what Pedroza and third-year student Kayla Kisseadoo, along with alumnae Miriam Carlson ‘15, did once they were contacted by Black Lives Matter Tampa. The trio raised money and collected donations —- from blankets and clothes to food — which they delivered themselves, across the country, to aid protesters in Standing Rock, North Dakota, at the Dakota Access Pipeline. “In the span of one week, we posted the fundraiser on every social media network, held bake sales, and went door-to-door, asking for any and all monetary or in-kind donations that we could take with us to Standing Rock,” Pedroza said. Pedroza was also one of several students who participated in the Fight for Farmworker’s Rights in the Boycott Wendy’s campaign. The campaign claims the fast food chain has refused to sign the Fair Food Program, which would raise the wages of tomato pickers and ensure basic rights, such as protection from sexual violence or harassment. New College students first began protesting for farmworkers’ rights at Publix grocery store locations in Sarasota. Then they piled into a bus —- appropriately titled ColumBUS -— on their way to Ohio State University’s Columbus campus, near the national headquarters of the Wendy’s chain, to join in a national protest. While in Columbus, students from colleges and universities around the country marched with those of Ohio State. As part of the protest, students from Ohio State fasted for a week. Upon their return to Sarasota, five New College students began a fast in solidarity with them. More than 80 New College students, faculty and staff joined these five students for a day. Student activists have also been able to bring activism from the nation to campus, like Saif Iqbal, who graduated in May, spent his thesis year helping to organize a Million Hoodies for Justice chapter, along with third-year Dajé Austrie, at New College. 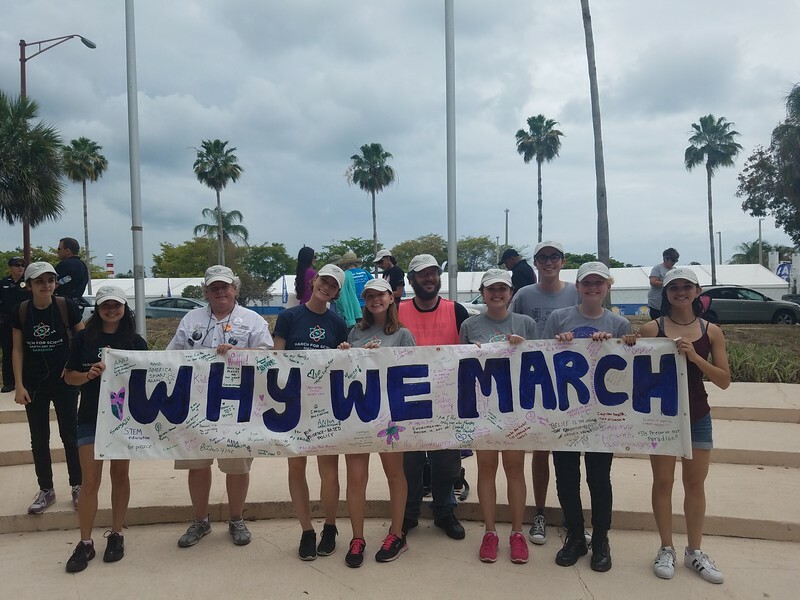 And other students spent their final year at New College organizing a local edition of the March for Science in Sarasota, all while working on their thesis projects. The March for Science garnered over 1,200 attendants, and was covered by publications and news organizations such as the Sarasota News Network, SRQ Magazine and the Sarasota Herald-Tribune. There was also a large turnout of residents from the Sarasota-Bradenton area. It’s a beautiful mid-May day on Tampa Bay, off St. Petersburg, perfect. New College students sharpen their teaching skills in local high school classrooms. New College students share their gift of languages with the community. New College students tackle daunting projects at the Bishop Planetarium.